The Tennessee Recycling Coalition or TRC is a 501(c)3 non-profit organization dedicated to promoting recycling and sustainable materials management practices in the State of Tennessee. We are a coalition of many industries, companies, and individuals networked together to raising recycling as the standard in Tennessee. We recognize that recycled materials have value and contribute to the economic well-being of all Tennesseans. Recycling promotes and sustains jobs, adds to the revenue of local governments by growing the tax base and through the sale of collected commodities. Recycling further enhances the personal wealth of all Tennesseans through cost avoidance of landfill tipping fee charges. Ultimately, it also protects the environment by keeping the materials out of the landfill. TRC works in partnership with the local, state, and federal governments to provide resources, education and outreach for the recycling message. We are proud of our accomplishments and strongly support the manufacturing industries in Tennessee through our partnership messages. These messages promote high quality feedstock that fuels their manufacturing. 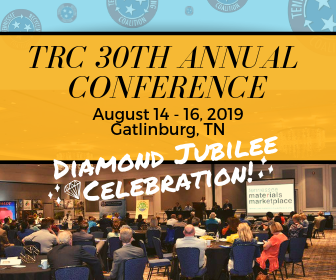 We have set the dates for our 2019 Annual Conference which will be August 14-16, 2019 in Gatlinburg, TN at the Park Vista Hotel. This is going to be our 30th annual conference and we are working hard to put together a great conference with lots of exciting speakers, keynote speaker, top notch content, networking sessions, exhibitors, and more! The Tennessee Recycling Coalition will continue offering workshops per our membership and market demand. You're familiar with our previous partnership with Resource Recycling Systems that brought talented speakers to a variety of locations and businesses across Tennessee in 2017-18. Click here for a recap of this success workshop series. What has TRC been doing this past year? TRC has been quite active the past year carrying out our mission through our own resources in addition to several valuable partnerships. Click here to see how TRC has been fulfilling our mission in the past year. Here's a link to our published 2016 Annual Report. Over 150 participants, 20 Exhibitors and Excellent Local, Regional and National Speakers made our 29th Annual Conference a great success! The conference was held at the Franklin Cool Springs Marriott August 12-14, 2018. Thanks to all the participants and our sponsors whom without the conference would not be possible. We are now making plans for our 30th Annual Conference exploring a late summer possible Gatlinburg, TN venue celebratory year! Stay tuned for more information in the upcoming months. Find over 1,000,000 ways to recycle on Earth911.com, host of the largest and most accurate recycling directory. From batteries to motor oil to paint to plastics, you can find recycling and proper disposal information for more than 300 products using our expert-verified database. Earth911.com also writes daily stories to keep you in-the-know and up-to-date on the latest trends, ideas, tips and tricks to make your green lifestyle choices simple. Visit Earth911.com today to get a jump start on the easiest way to go green: recycling. New to recycling or want to know more about recycling and waste? Click here for an informative and well made YouTube by Cumberland County Solid Waste Department.